For many, the Thanksgiving holiday weekend might be filled with shopping sales at big-time retailers and small businesses. 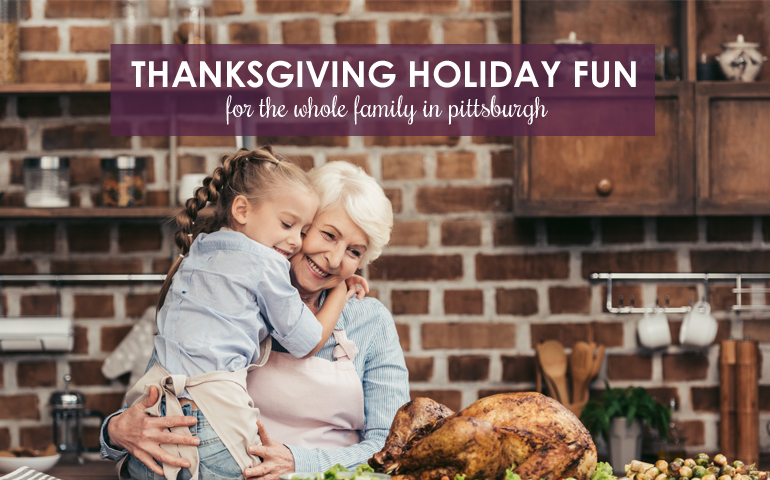 But for those who would rather avoid the crowds and spend the holiday with family and friends, Pittsburgh offers plenty of other activities to keep you busy. Pittsburgh’s official light-up night might already have passed, but you can still enjoy holiday lights the Pittsburgh way at Kennywood Park. The amusement park’s legendary rides are decked out for the holiday season with over two million lights! With holiday songs, light shows, Santa and more, Kennywood’s Holiday Lights will be a family tradition for sure. Too cold to enjoy holiday beauty outdoors? Head on over to Phipps Conservatory, where you’ll see holiday trees and over 2,000 poinsettias displayed indoors. This incredible holiday display lasts through January 6th, so be sure to soak in the natural holiday beauty at Phipps before it is replaced with new signs of spring. Thanksgiving kicks off heavy eating for many of us that lasts throughout the holiday season. Before you get your fill of turkey, stuffing and all your other favorite fixings, why not get in a little festive workout? The 28th Annual YMCA of Greater Pittsburgh Turkey Trot is back, and it features everything from a 5-mile trot to a 1-mile family fun run. Get out there on Thanksgiving Day and gobble up some exercise before filling up on your favorite holiday foods. What would the holiday season be without a parade? Downtown Pittsburgh will be filled with festive holiday fun during WPXI’s Holiday Parade on Saturday, November 24th. Bring the entire family and join in the holiday fun from 9 a.m. to 11 a.m. You’ll see celebrities, bands, balloons and so much more. Once you’ve had your fill of turkey, switch your thinking to another type of bird… the penguin! Our hometown hockey team is hosting the Columbus Blue Jackets at PPG Paints Arena on Saturday, November 24th at 7 p.m. Start a holiday tradition by bringing the whole family to root on the Pens! Open daily throughout the holiday season, the MassMutual Pittsburgh Ice Rink is the perfect holiday activity for children of all ages. With the city as a backdrop, you, your family and friends can ice skate during the day or under the stars at PPG Place. Talk about holiday magic in downtown Pittsburgh! These festive happenings are just right for the holiday season but don’t forget about all the other amazing restaurants, museums, arts and other activities that are always going on in and around Pittsburgh. However you decide to celebrate this year, from the Berkshire Hathaway HomeServices The Preferred Realty family to yours, we hope you have a safe and Happy Thanksgiving!